Most payments using the new Apple Pay system will be limited to £20 when it launches in the UK in July, the BBC understands. Major UK banks, apart from Barclays, have announced they will offer the new system. So, too, will many retailers. Apple Pay allows owners of an iPhone 6 or an Apple watch to pay by touching their devices on contactless pads. But banks have told the BBC payments will be capped at £20, similar to existing contactless payments. The limit on contactless debit and credit cards is due to rise to £30 in September. While that is likely to be the limit for most Apple Pay transactions, it is thought that agreements with some retailers may allow for higher payments too. "The majority of terminals will work to a £20 cap, whether with a debit or credit card, or a contactless device," a spokesperson for Mastercard told the BBC. However, rival card provider Visa said many retailers would be hoping to offer higher value transactions as soon as possible. "Not all retailers will have the limit at launch - and there will be others who will choose to get rid of it all together in time," said a Visa spokeswoman. Higher transaction limits are partly possible because Apple Pay is thought to offer greater protection against fraud. The system grants a one-off pay token to the retailer, instead of passing across bank account details. Fraud on contactless cards currently accounts for 0.7p in every £100 that is spent, according to industry body, the UK Cards Association. 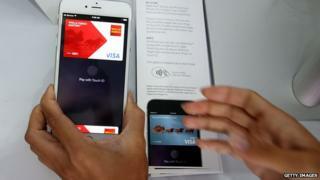 Apple Pay also allows customers to pay online, by using finger print technology. Retailers including Marks and Spencer and Waitrose have announced they will offer the service when it launches. However Tesco said it had no plans to formally adopt the system, although the technology will work in some of its stores in London which already have contactless payment facilities in place. Asda said it would not be taking part. Its parent company Walmart has not signed up to Apple Pay in the US. Sainsbury's also said it had no plans to offer Apple Pay. However, any retailer with contactless technology already installed may find it has no choice but to accept payment, as Apple Pay uses the existing contactless system. London Underground, for example, said that visitors from the United States who are registered with Apple will already be able to use their phones to pay for tube journeys. Contactless journeys on buses and the Tube in the capital account for 17% of all such transactions in the UK. A rival service from phone operator Samsung is likely to launch in the UK later this year. Read more about Apple Pay and the company's new music streaming service.